Preparations are ramping up for the Buffalo Bill Center of the West’s Forged and Founded—Western American Sculpture symposium on Saturday, June 17, 2017. The day-long program takes place from 9 a.m.–4:30 p.m. at the Center. Ensamble Studio (Antón García-Abril and Débora Mesa), Inverted Portal, 2015. Image courtesy of Tippet Rise/Iwan Baan. Photo by Iwan Baan. Sponsored by the Center’s Whitney Western Art Museum, sculpture symposium organizers have gathered artists, artisans, and art historians to share stories and insights, and a wealth of knowledge on sculpture of the West. 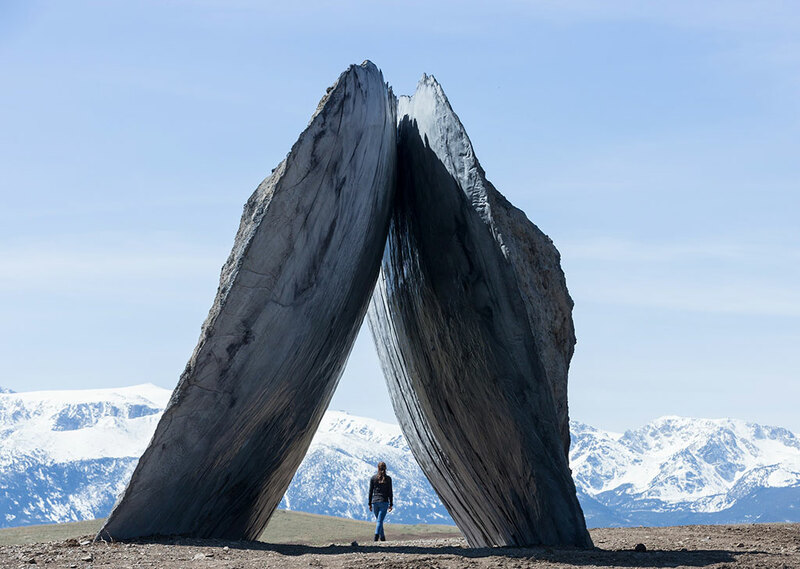 Antón García-Abril and Débora Mesa of Ensamble Studio, discuss their Structures of Landscape they created at Tippet Rise Art Center, Fishtail, Montana. Carol C. Clark, the William McCall Vickery 1957 Professor of the History of Art and American Studies-Emerita, Amherst College, Amherst, Massachusetts, discusses American sculpture, 1850–1925. Nicole Harrison, the Whitney’s Curatorial Assistant, leads participants on an outdoor sculpture tour around the Center’s campus. Peter H. Hassrick, noted art historian, examines the work of sculptor Alexander Phimister Proctor. Phimister Proctor “Sandy” Church, grandson of A.P. Proctor; Beverly Perkins, the Center’s Chief Conservator; and Allison Rosenthal, a former Center intern, demonstrate how x-ray fluorescence is used in the study of bronzes. Ellen Roberts, Harold and Anne Berkley Smith Curator of American Art, Norton Museum, West Palm Beach, Florida, shares perspectives on sculptress Gertrude Vanderbilt Whitney. Sculptors Tracy Linder, Dustin Payne, Vic Payne, and Linda Raynolds are on hand for visual arts presentations. Costs are $25 for students, $55 for Center members, and $65 for non-members; the fee includes lunch. Pre-registration is encouraged and online registration is available. For questions and more information, contact Nicole Harrison at [email protected] or 307-578-4051. Funding is provided in part by the Peters Family Art Foundation, Bill and Robin Weiss, Carlene Lebous and Harris Haston, Hope and Edward Connors, the Proctor Collection Endowment Fund, and a grant from thinkWY|Wyoming Humanities.